Construct a ABC in which BC = 4.5 cm, B = 45o and AB - AC = 2.5 cm. Justify the construction. i) Draw a ray BX and cut off a line segment BC = 4.5 cm from it. ii) Construct XBY = 45o. iii) Cut of a line segment BD = 2.5 cm from ray BY. 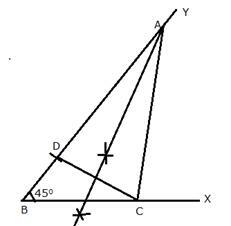 v) Draw perpendicular bisector of CD cutting BY at A.
ABC is the required triangle.